There needs to be enough axle present in the drop out as well. 2mm from outside of drop out is plenty. My personal rides have about 1 mm. A strong bite with good serrations and high clamp force on the skewer should do the job. My son had this problem on one of my vintage rides and we never resolved it. Once he changed to an aluminum frame the problem went away. Obviously you have an aluminum frame. If the bike is quite old and previously mistreated it's possible that the right dropout may be damaged by repeated slippage, and no longer gives the nut on the axle a flat surface to grab. sometimes the only fix short of frame repair is a toothed washer on the inside of the dropout. This is a vertical dropout, not the horizontal type I assumed from your OP, so the axle slippage is minimal. 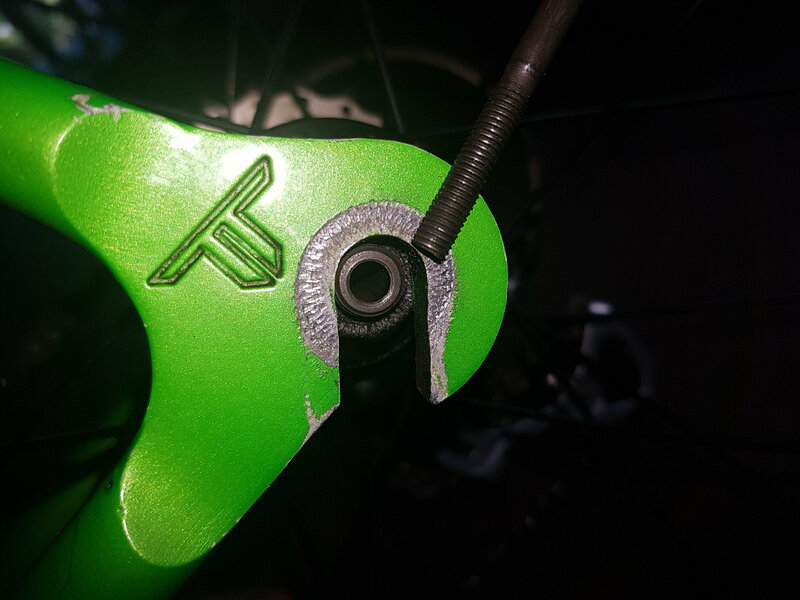 As noted it is indeed oversize for the axle and a possible solution, beyond a tighter qr skewer, would be to shim the dropout to take up the extra space. A strip of thin sheet metal could be cut to fit.